Goverlan Remote Support Blog > Goverlan v8 News > Announcing Goverlan Free Remote Control! Goverlan Free Remote Control is now available! I am writing this from the show floor at TechMentor 2015; what a great place to announce a new free product focused on SysAdmins! Top 5: What makes Goverlan Free Remote Control special? Active Directory integration: Surprisingly, being free is NOT number 1, being integrated with Active Directory is. Why? Because you support users, NOT their computers. With Goverlan Free Remote Control you can search for a user in AD and resolve to their current user session (or real-time logged-in workstation detection). No more asset tag or computer name conversations, you will know where the user is logged-in. 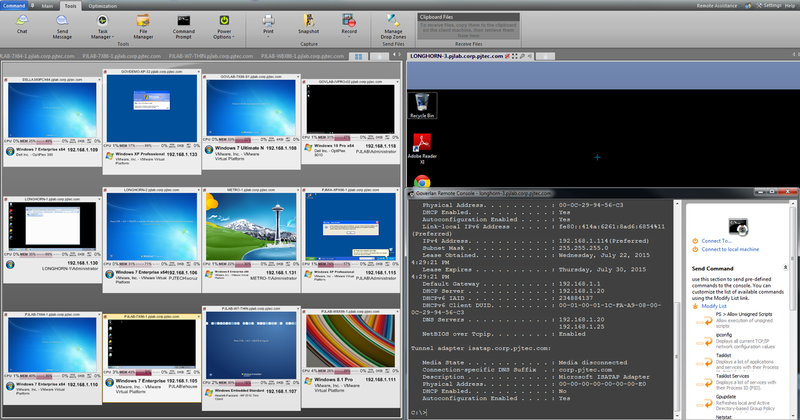 Multi-Machine Monitoring views: Open remote control sessions on multiple machines at once and “tile them”. Once you have a view set up the way you like, you can save it as an icon for fast re-access. This one is hard to describe, but really cool when you see it, so download Goverlan Free Remote Control! Multiple Supported Protocols: Choose from multiple remote control protocols and connect to Macs, Windows, Linux, and SSH devices. “Tile” these connections using monitoring views. Credentialing Manager: Specify and save alternate credentials for computers, servers, IP ranges, or domains so you can quickly establish remote control sessions. It’s Free! Not sure if I mentioned it was free… it is. It installs and is setup in a few minutes. After that you are all set, use it, enjoy it, and send us some feedback. We want to build products you love, even free ones. Happy SysAdmins Day from Goverlan!